Arsenal legend Paul Merson has blamed the Aaron Ramsey transfer situation on the ridiculous wages handed to Mesut Ozil when he signed a new contract last January. 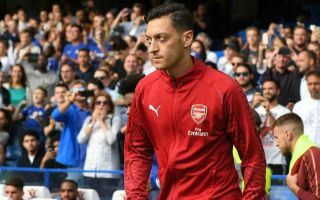 ESPN have claimed Ozil’s wages at the Emirates Stadium are as high as £350,000 per week, and that that could hit them in the transfer market as well as in terms of keeping their current players. Ramsey’s current Arsenal contract expires at the end of this season, and it looks as though he’s heading to Juventus next, according to Mediaset and other sources. The Wales international is a big loss, and Merson believes Arsenal have been unable to give him the kind of wages he wants, or arguably deserves. Ramsey has been in fine form whenever he’s played for Unai Emery’s side this season, and has generally always been a reliable member of this squad. Ozil, on the other hand, has often looked an overpriced signing and a player not worth the kind of money he’s reportedly getting, with the German known for disappearing in big games and not making the most of his superb natural talent. This deal now looks like bad business for Arsenal, and Merson has pinned the Ramsey struggles and other transfer-related issues down to that. ‘Letting (Aaron) Ramsey leave is just bad, bad club management isn’t it,’ Merson is quoted by the Metro. ‘To let player contracts run out in this day and age for how much these players go for and how much they’re worth is criminal. To let him leave the club and walk away for free, somebody in his prime leaving for nothing, it’s a football crime. ‘Now they have got to replace him and that will cost money but until the (Mesut) Ozil problem gets sorted out they are going to find it difficult to bring in players. ‘Because if they bid £50-60million for someone, the first thing the player will say is well I want what Ozil is getting.